This is a very easy DIY Thank You Gift that would work great for almost anyone you need to give a small thank you to! We made these up to give to some teachers and school staff at the end of the year. 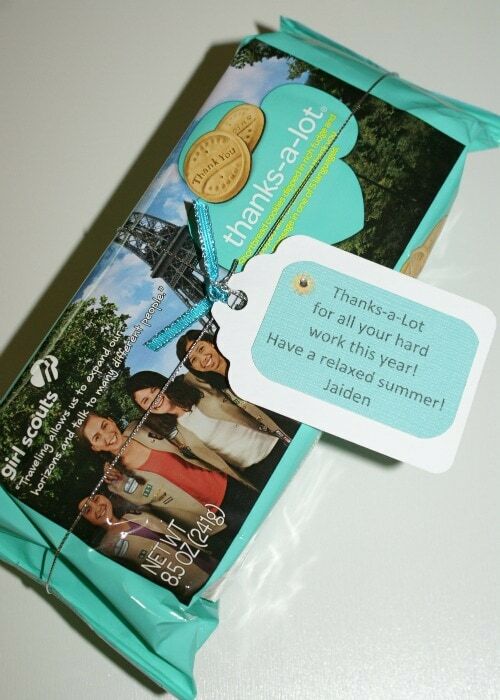 The thing I love the most about this thank you gift is that you are also helping the Girl Scouts out in the process! One of my daughters was a girl scout this year. I bought extra Thanks-a-Lot cookies to use as gifts! We used some at the open house at my husband's office last month and I am using the rest to give out to teachers and staff! I started off using a large tag punch. This is a very simple way to cut out tags. I just used a sheet of white cardstock for the tags. 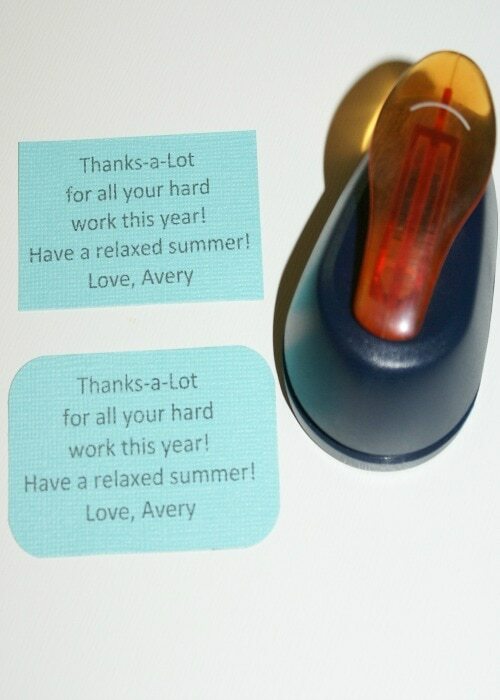 Next I typed my thank you message in Word and printed it out on colored cardstock. I cut the cardstock down to fit inside the tag. I used a corner rounder to round the corners of the message to make it look a little nicer! I used a hole punch to put a hole in the top of the tag. I used scrapbooking adhesive to adhere the message to the top of the tag. I wanted to make the tag a little bit snazzier so I added a tiny sun with a rhinestone in it. I just used a small sun punch I had and a self-adhesive rhinestone. Last thing I did was add some ribbon to the tag and attached the tag to the cookie package using some silver string. 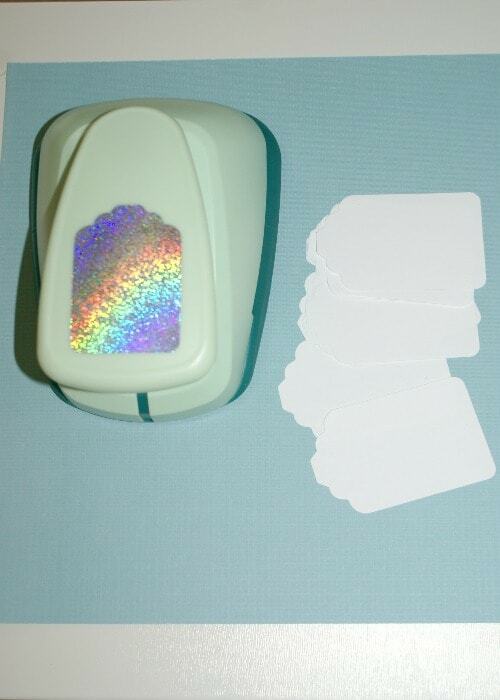 You could also use regular ribbon or gift wrap ribbon to attach the tag to the package. Here is the finished product! The girls were very excited to take these to school on their last day and give them out to teachers and staff that they really cared about! I don't think thank you gifts always have to be big and expensive. I don't know very many people who wouldn't love to get a package of Girl Scout cookies! This was an easy DIY thank you gift that shows we care! It was also nice knowing that the money we spent on the cookies goes to help a great organization! 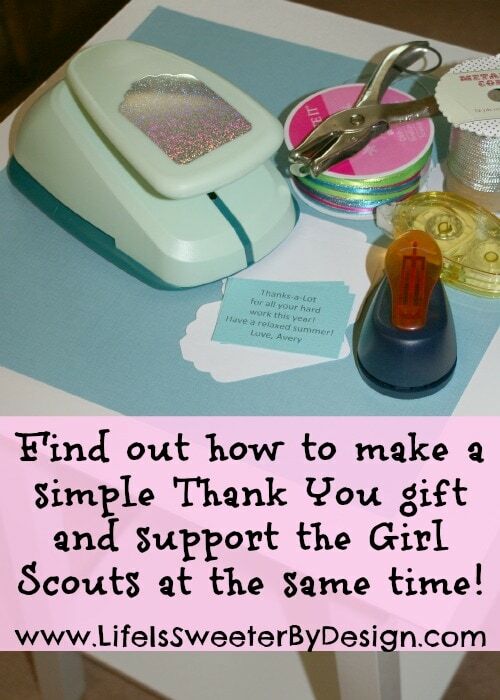 What is your favorite Easy DIY Thank You Gift to give or receive? This is super cute! I’m definitely going to have to get some of these cookies next time so I have some gifts on hand! I always love a super quick to make DIY. Love it! Thanks Stephanie! I love quick and easy too!! I get more done that way!